Family history timeline Twile have today released a new infographic feature, designed to help family historians share their research and engage younger generations. With over 60% of family historians concerned that their findings will be lost or forgotten and 74% doubtful if anyone will continue their family history research,* Twile have come up a quick and interesting way of getting non-genealogists interested in their ancestry. Twile’s new personalised family infographic is free and available to everyone – whether currently using Twile or not – at http://www.twile.com/numbers. Users simply import their FamilySearch tree or upload a GEDCOM and their infographic is automatically created. Users will be able to see statistics such as the average number of children per family, the most common surnames, the ratio of men to women and the average age of marriage. The infographic can then be shared easily with other members of the family. 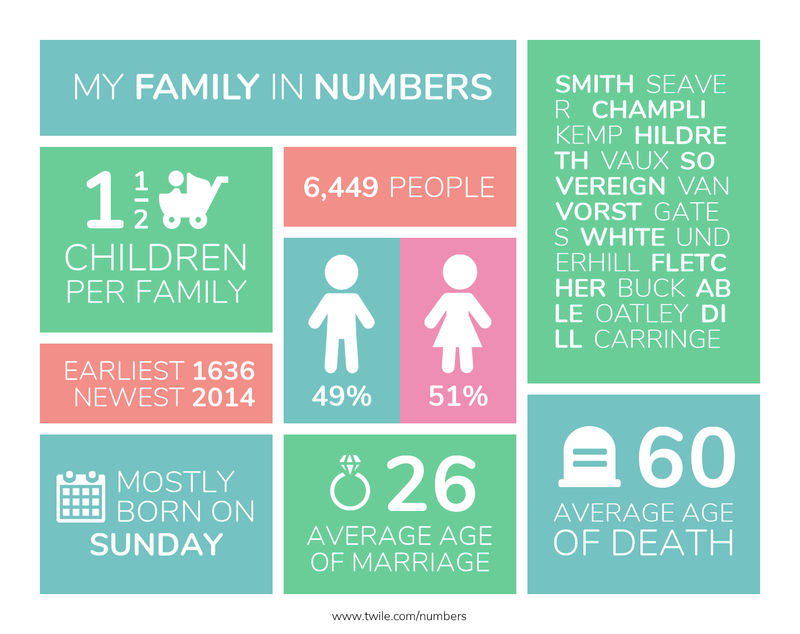 Because 80% of family historians use social media, such as Facebook and Twitter, to communicate with friends and family, Twile have designed the infographic to be shared online, as well as downloaded and printed. Twile will have a competition running throughout February to win a $200 Amazon gift card. Customers can create their infographic at www.twile.com/numbers, share it and tag Twile on Facebook (@TwileTimeline) or Twitter (@TwileTweets) to enter the prize draw. Twile is a UK-based interactive timeline of everything that’s ever happened in your family. The timeline consists of photos and milestones—such as births, marriages, and deaths—that tell the story of your family from your earliest known ancestor right through to today. Family historians can import their family tree from any online genealogy service and then add more recent events from their own life before inviting family members to explore and contribute. While the Twile website is aimed primarily at family historians, it is also designed to encourage the rest of the family to add their own content, including the younger generations. Twile was the winner of two innovation awards at RootsTech 2016, including People’s Choice. *Twile conducted research with Findmypast customers in August 2016. Disclosure: I have a complimentary Twile subscription for providing publicity and objective opinions of the service.